When popular style is becoming a trend, portable speakers begin to become popular as same as street dancing a couple years ago. 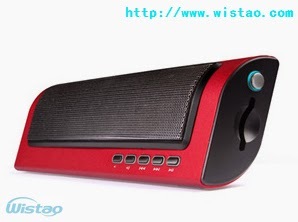 Features of portable speakers is compact, portable, and quality sound to meet needs of people's daily lives, such as learning, entertainment, leisure, etc. It can play portable media such as SD card, TF card, USB disc and so on. Music signal as MP3 or WMA which are stored in these media above mentioned, and those music signals will be decoded by decoding circuit inside through digital-to-analog conversion, and then they will be amplified by power amplifier circuit to drive speakers for playback. Wistao technology released several products to markets. Speaking broadly, portable speakers is small in volume and distinguish itself from those larger HIFI home theaters, music centers, 2.0 or 2.1 multimedia speakers, etc.. General it’s volume are relatively small and can be easily put in bag, using storage card or wireless signal to play music media, and getting power from battery; its main advantages is portability. Not only indoor but outdoor can play normally. But anyway, it is a class of active loudspeakers. We will explore its development story from portable view. Stereo or speakers were not considered as portable before transistor hit market. Perhaps you might also see some antique tube radios or phonographs working with horn speakers from film and television; they were generally to be placed somewhere in room like living room or reading room. If present electronic products compared with it from volume view, it will be described as a small sorcerer in the presence of a great one due to its bigger volume. By the way, you can find a computer at that time, which volume was larger as a building. With transistor application, electronics product’s volume became smaller and smaller, thinner and thinner. Last 1950s and 1960s, Sony used transistor technology to make radio and instant hit in the United States, opened U.S. market. And later Sony developed an innovative products Walkman, which could be said is an "originator" of portable speaker. It is an analog audio player based on tapes. After then CD emerged, it marked advent of digital age, is " 0 " and " 1 "era, which greatly improved sound quality of audio playback.CD avoid mechanical wear as tape player due to its non-contact signal reading technology, also avoid distortion of the signal source. After two or three decades, Internet age was coming. Industry found a 640M CD disc that can be stored only ten to twelve tracks, CD disc capacity is limited and does not facilitate transmission within networks, so they developed music compression format technology firstly --- MP3 format, that did not affect the sound quality of music, and track capacity became smaller from 30 to 40 megabytes of CD format to only a few megabytes of compressed MP3 format for a same track, so it’s transmission within internet network becomes very easy. During this period, portable CD player based on a CD disc media called Discman emerged; its music is listened by headphones. And MP3 player was also hit market as portable music devices, but it needs to use headphones to listen. With popularity of desktop PC, multimedia speakers have become a standard of the computer active speakers, but it can only be accompanied by the computer around as much less as portable. During the period, a variety of digital products such as SD card, TF card, USB disk were be developed, and their storage capacity was also growing; Large capacity rechargeable battery and LSI Class D amplifier were adopted on portable speaker, it made portable powered speakers miniaturization, which also led to emergence of digital portable speakers, to achieve a truly "portable", which is digital portable speaker today. Technology continues to progress, and it has also changed our lives. 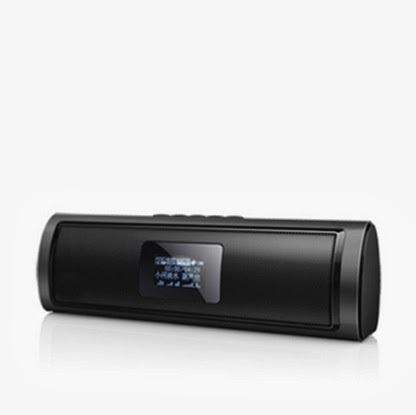 With advent of powerful decoder chips, portable speakers’ feature also is becoming more and more powerful, many functions have been added to portable speaker, lyrics display, repeat, breakpoint memory, multi-format music player, etc. ; while added bass enhancement technology to speakers’ cavity, it can reproduce familiar quality sound as HIFI speaker. Turn your iphone or android into disco with Portable Wireless Speakers. We call them tweakers! With big bass sound and full sound these small packages pack a large punch! Yeah, it a portable and small but big sound! Thanks for sharing! Do you have any suggestions for a good bluetooth headset case? There a link http://www.wistao.com/en/service_doc_show.html?id=742, maybe it can answer your question, please click it. This product has good specification and seems to offer great benefits to the users. I'm also using same kind of portable speakers for better sound quality ! !